I've played golf since I was about 7. I played every weekend, and even used to train sometimes during the week for a while. I was a good player. 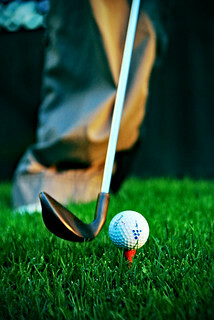 And then I stopped playing; for various reasons I did not touch my golf clubs at all for almost 4 years. Until last September, where I played a couple of days. Not as bad as I'd been expecting. Since then I've played only a handful of times, and Alex is learning. We are trying to institute golf Thursdays for quite a while, but it doesn't seem to be catching. We've only gone to play on a Thursday once - and it wasn't today.